Combined Category C, B tested protector (to BS EN 61643-21) suitable to protect Cable, Terrestrial and Satellite TV systems. For use on lines running within buildings at boundaries up to LPZ 1 to through to LPZ 3 to protect sensitive electronic equipment. 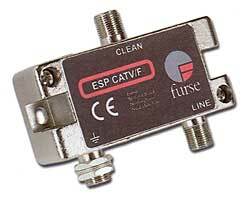 Use to protect analogue and digital Cable, Terrestrial and Satellite TV installations. ESP CATV/F, ESP MATV/F, ESP SMATV/F and ESP TV/F are suitable for systems using F connectors. ESP TV/EURO is suitable for systems using EURO-TV connectors. For further information on TV applications, see separate Application Note AN006. Connect in series with the coaxial cable either near where it enters or leaves each building or close to equipment being protected.